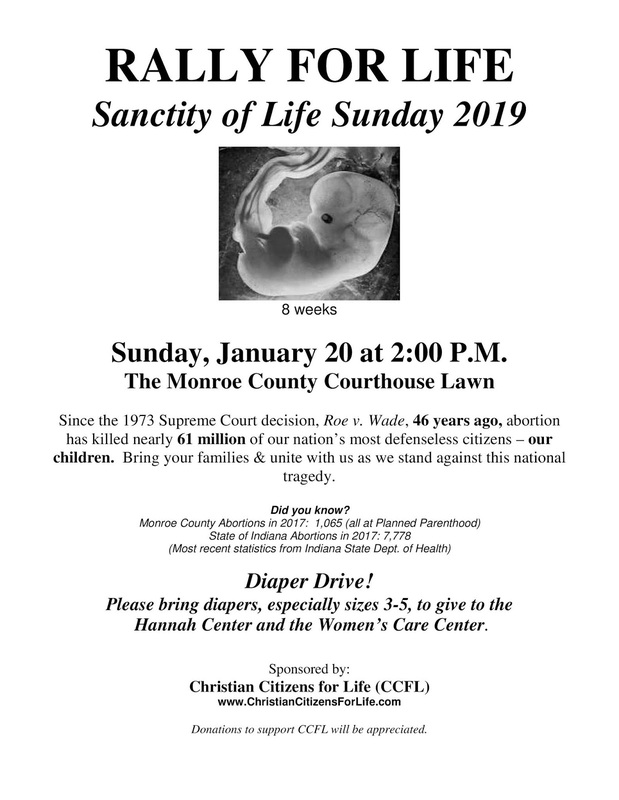 Christian Citizens for Life announces the annual Rally For Life, which will be held on Sanctity of Life Sunday, January 20, as we sadly remember the 46th anniversary of Roe v. Wade) at 2:00 pm on the lawn of the Monroe County Courthouse. We will gather to pray and listen as Stephen Baker, Associate Pastor of Clearnote Church Bloomington, brings us a timely message, and we will conduct our annual march through part of downtown & around the square as we stand against the barbaric killing of our most defenseless citizens – our children. Though generally down in Indiana, abortions are way up in Monroe County. Here are the shocking numbers. 2014 – 718 babies murdered by abortion. 2015 – 822 babies murdered by abortion. 2016 -- 1,016 babies murdered by abortion. 2017 -- 1,065 babies murdered by abortion. Source: Indiana Department of Health statistics. This is an average of 20 children per week, right here in Bloomington. We MUST take a stand against this senseless killing that continues to poison our community. We invite you to join us for this rally. 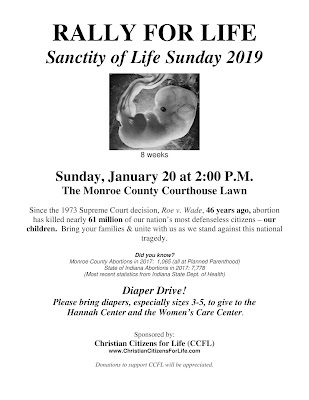 We are encouraging participants to bring a package of disposable diapers, especially sizes 3-5, for the Hannah Center and the Women’s Care Center, and donations for the support of both centers and also for Christian Citizens for Life are gratefully appreciated. Please stand with us to defend those who cannot defend themselves. We look forward to seeing you there!